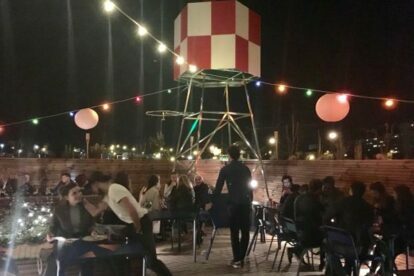 Ladies and gentlemen, right on time for summer, there is a new rooftop in town; a rooftop that will transport you far away, in Brooklyn. With its alluring red and white water tower and its post-industrial look, it truly seems as if you just crossed the Brooklyn Bridge. Indeed, Café Voisins 105 is more than just a pretty rooftop, it is mostly a gigantic co-working space offering private and shared working space for both private companies, startups and entrepreneurs alike. Even though it is their biggest space so far, it is the little brother of Voisins Plainpalais and Voisins Grenus. They also offer food with a Texan smoky touch; yes, meat lovers, we are talking about brisket, pulled pork, ribs. To finish the American touch, the menu even has mac & cheese! I told you we were in Brooklyn, USA, baby! For those who want to work and play, they have crafty cocktails (16 CHF) and beers from Lausanne microbrewery, La Nébuleuse. And lagniappe (American term for “bonus” to stay in the theme), they even have a cool dance floor that has a US high school prom nostalgia feeling to it (kind of quirky but charming) and a foosball table for the boys! With the days getting longer and the sun finally showing up, this rooftop has a promising future ahead of him. I cannot wait to come back to party all night!